Westchester’s Justin Cassinelli was selected the 2014 Region XV Division II Player of the Year. 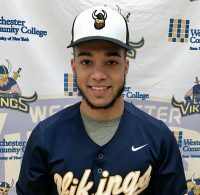 The first baseman led the Vikings with 49 RBI while batting .430 and the Region XV Championship. Westchester’s coach Billy McClure was named Coach of the Year. Rockland’s Danny Demetrops was named 2014 Region XV Division II Pitcher of the Year. The freshman ended the 2014 season with a 5-1 record with a 1.80 ERA. Orange’s Nick Gurda was named the 2014 Region XV Defensive Player of the Year. Joining Cassinelli, Demetrops and Gurda in the All-Region First Team are Fabio Ricci (Westchester), Billy Seymour (Rockland), Tyler Allen (Westchester), Dillon Merola (Orange), Steven Figueroa (Westchester), Victor Sanchez (Rockland), Matthew Cassinelli (Westchester) and Schuyler Martire (Orange). Demetrops took two spots in the first team – Pitcher and Designated Hitter. Selected to the Region XV All-Sportmanship Team are Michael Ladka (Sullivan), Andre Conover (Ulster), Joe Lovecchio (Westchester), Nolan Apfel (Orange), Nick Kulbaba (Rockland) and Henry Blanco (Dutchess).